We have many different types and colors of paper to print or copy your resume on for a professional touch. Welcome to CL Printing. We are located at 1210 SW Highland Ave. in Redmond, OR across from 7 Eleven. "Our goal is to give you great service and quality at a reasonable price." We offer many services for businesses and every day customers. We have the ability to print digitally for smaller orders or use our press for larger orders. We also offer resonably priced graphics & Logo design work. Do you need Blueprints copied, printed or scanned? 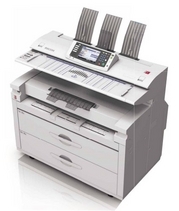 We have a Ricoh Blueprint copier, printer, scanner. This means we have the capability to copy your large format black and white prints at a rate of 14 pages per minute. We can also scan prints to CD/DVD or email them. We have the greatest prices in town, just call and ask. This machine also allows us to reduce and enlarge prints and we can scan anything up to 36" in width in full color. Come on down and check it out.